Carol Burris asks: If teachers are judged by student test scores, how about state education leaders? Wonder who is responsible for poor relations between police and non-whites? TEACHERS, OF COURSE! With PARCC online assessments coming, watch out for the next trend – assigning elementary students typing homework to prepare them for the tests. Another trend to watch out for: Womb to Workplace data tracking. The National Association of Secondary School Principals is officially coming down against VAMs (value added models) for measuring teacher effectiveness. Seven things teachers are sick of hearing. A great piece from Chris Cerrone on the role of the Common Core in the myth of failing schools. Regents Chancellor Merryl Tisch has announced that the process of finding a replacement for King will be conducted in secret with no input from the public. In fairness, this is no different from prior appointments, but at the same time, considering that he was (in the eyes of most educators) such a complete failure, wouldn’t getting a little input be the right thing to do? In the meantime, King’s interim successor will be Elizabeth Berlin, who is currently executive deputy commissioner of the state education department. Although she is the one being given the title of interim commissioner, she will be sharing day to day responsibility with Ken Wagner. No explanation was given for this odd arrangement, but it may have something to do with the fact that Ms Berlin actually has even less experience with public education than John King. There have been a few high-profile “reformer” types who have moved on from their positions of late, leading to the question – is this the beginning of a new era? Sadly, the answer seems to be no. There were no surprises in the reactions to the announcement that King would be leaving. The Lower Hudson Journal published a scathing editorial. NYSUT issued a statement, as did the Badass Teachers Association. Carol Burris wrote a typical (i.e. beautifully written, direct, and dead-on) piece in the Washington Post looking at King’s legacy. 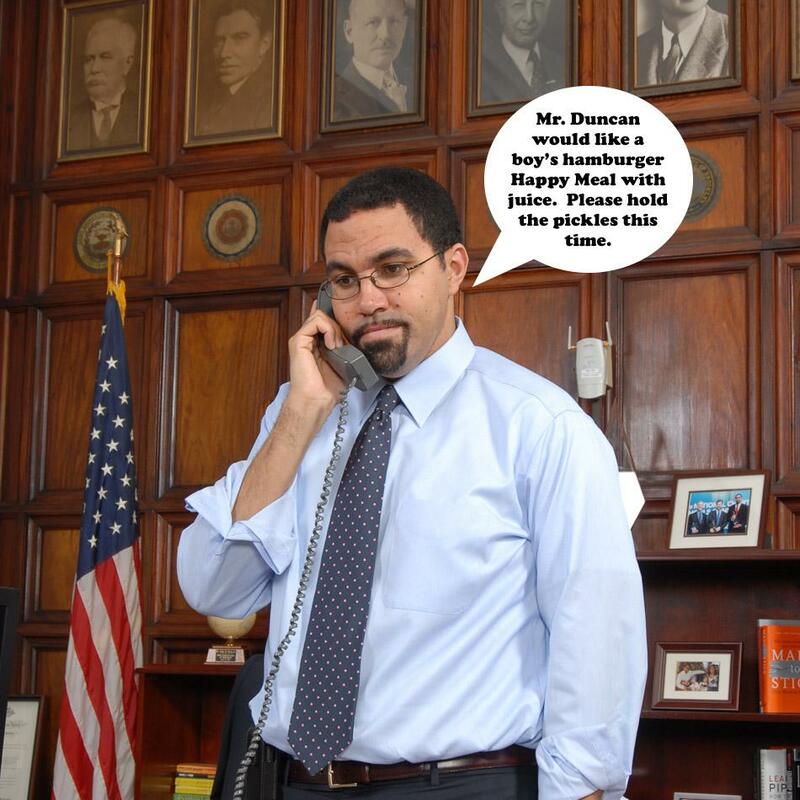 In case you’re wondering exactly what John King’s responsibilities will include at the USDOE, here’s a picture from the near future (courtesy of Lace to the Top). The other day we posted a satirical article about field testing, and then there was this, which brings to mind a piece in the Washington Post claiming that satire is dead. They made a good point. After all, how can we try to highlight the ridiculousness of the Pearson Corporation when their website features a Common Core gift guide?! And how can we mock the arrogance and pretentiousness of our Governor when… well, you’ve got see this to believe it. We reported earlier how political action by Massachusetts teachers helped to knock down a horrific proposal from their state Ed Dept that could have had disastrous consequences. This article (courtesy of Diane Ravitch) gives a full accounting of how it happened. Arnie Duncan wants to raise the standards for education schools. Maybe that doesn’t sound like a terrible idea – until you look at the actual proposal. Speaking of brilliant ideas, State Ed Commissioner John King want to make sure that when the APPR system is updated, it includes student surveys. Harvard Law Professor and self proclaimed “thorn in Governor Cuomo’s side,” along with several pro-education organizations, is leading a fight to protect public schools from starvation and corporate takeover. Click here to sign the petition and tell Gov. Cuomo and State Legislators: Don’t let Wall Street buy our public education system the way they bought the last election. As previously mentioned, the Board of Regents is looking to make participation in field tests mandatory. The window for public comment is now open, so please make your voice heard by clicking here to send a message to the Governor, the Regents, NYSED, and our elected officials.